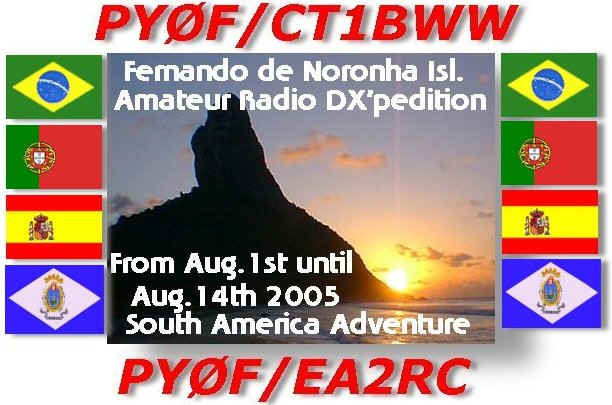 Welcome to FERNANDO DE NORONHA island DX'pedition. 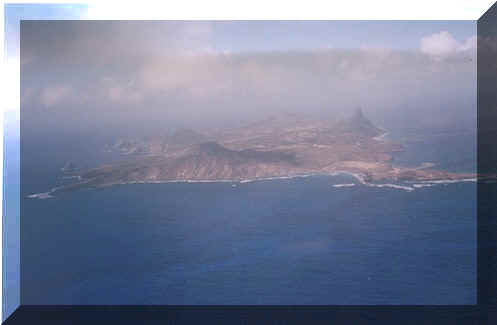 The purpose of this web is to promote Amateur Radio and DX at this beautiful island located at South America. 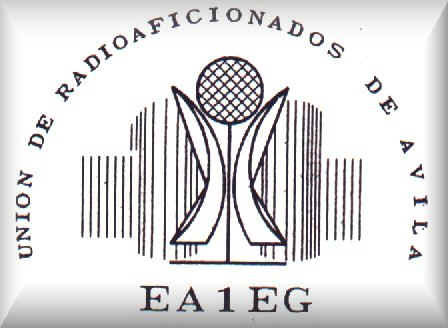 This is a NEW Project envelopment Amateur Radio and Tourism but this time we're not going alone, instead a family week vacation we decide to take a enjoyable company with some friends. So this is NEW for Us, our both families know each other along time so it's easy to make small vacation together. When we decide playing radio our both wives can enjoy beach . In fact you can plan a small vacations with some fun operating radio. We've look around, and found out excellent conditions here in south america. Of course we have no problem with language and also to get license, we're grateful to ANATEL and LABRE. This is also can be a good way to human relationship and cultural knowledge between people from different cultures, Portuguese, Brazilian and Spanish. One of the real thrills offered to licensed amateur radio operator is the opportunity to work DX. 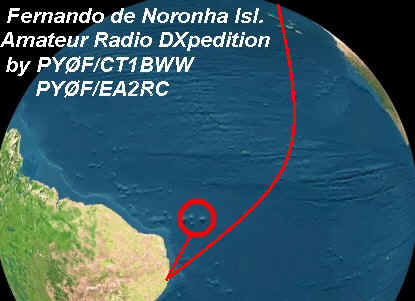 That thrill is trebled when the DXing is done from some exotic out-of-the way place like Fernando de Noronha Island (DXCC PYØF) in South America Atlantic Ocean. Unfortunately most of us have neither the time nor the money to travel extensively ... crossing oceans to far-flung islands on Pacific or Indian Ocean. We may never visit the other continents nor hope to ham from the moon. However, there is nothing to prevent any ham from sharing in the thrill of a DXpedition within reach of a simple transportation, in short vacation periods, and best of all on a exotic and paradísiac island, like this place. The wife was exciting with idea, the rig usually accompanies the family on every summer vacation. Installing the antenna and the rig is as important as setting up the the bungalow and preparing the first meal. The working of DX is fairly simple if the equipments includes WARC and 6 meters bands. Before going further, it might be appropriate to explain the rationale for what we are doing with this DXpedition. These days, with small radios and cheap air fares, there are many one- or two-man expeditions, and long may they continue. This is great news for the well-equipped DXer. However, after our S05X Western Sahara DXpedition, nothing we were the same. We would like to demonstrate that the important is the true friendship. Our objectif is to give you the chance to works us not even on one band or mmode . Indeed, for many of peploe , DXing wasn't a serious option. We want to be involved in DX, we want HF bands with activity with QRM . Peploe heard the DXpeditions going out and working the same DXers time and again. What we resolved to do was put on a DXpedition which would bring some excitement back to HF operation for those who were at a disadvantage, QRP's or with a simple dipoles or whatever reason. We want to work our way far enough through the pile-ups to give everyone an opportunity to work us at least once. Indeed, we would encourage those of you who have an HF rig that is gathering dust to put up, say, a single-band sloping dipole, aimed at PYØF, put the rig back into service, and give us a call. Maybe not in the first week or so of the operation, but once the pile-ups have started to diminish. At the same time, of course, we want to offer the chance to work us some new modes or band countries, hence the fact that we will also be operating WARC, RTTY PSK31, 6m, etc. And with only 2 operators a huge array of hardware, and almost a 1 week on the island, we believe we really can offer everyone the opportunity of some fun. If you have never taken 6 meters equipment as your only station on a DXpedition you have missed one of the most exciting and interesting pleasures in all of ham radio. On this adventure in South America We take 2 transceivers with HF plus 50 Mcs (6 meters) the Kenwood TS480 SAT . We know that Propagation Conditions are changing and this time not very good, but live goes one and is too short! You can see the Propagation Overview and our planning frequencies. Of course, because of the short distances normally covered , a good antenna is recommended for HF and 6 meters band. On the other hand, the smaller dimensions make this an easier antenna to pack along with other gear. This is the most exciting and interesting pleasures in all of ham radio you don't miss this. Having decided what is to go, it is well to talk over with the rest of the family where almost 2 weeks vacation is to be spent. We decided here on BRAZIL. 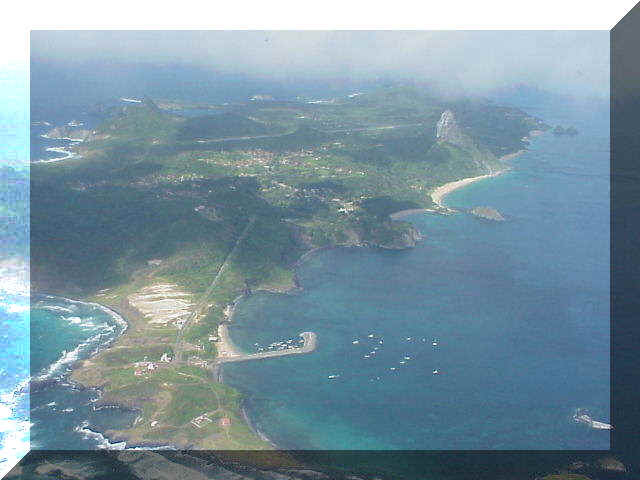 Where is located Fernando de Noronha Island in Atlantic Ocean ? Why Fernando de Noronha Island? The archipelago consists mainly of highly alkaline and subsatured volcanic and subvolcanic rocks and are part of a homonymous volcanic mountain developed along an E-W oceanic fracture zone. It encompasses an area of 18.4 km², 90% of which within the main island. There are also 18 minor islands outcropping on a reduced island platform that truncates the volcanic mountain as deep as approximately -100 m. The Remédios and Quixaba formations represent two major volcanic episodes. The former one, dated Upper Miocene, comprises pyroclastics intruded by phonolite and trachyte domes, plugs and dikes, as well as by a number of dikes showing a varied types of alkaline rocks. Erosion processes destroyed the volcanic rocks from this cycle, and was followed by the Quixaba Formation, during the Upper Pliocene, represented by ankaratrite lava flows, pyroclastic rocks and rare nefelinite dikes. The archipelago has a population of no more than 3,000 inhabitants, concentrated in the principal island, and a small floating population of tourists and researchers. It is a Marine National Park accessed by air flights, offering a pleasant weather, beautiful landscapes, wonderful beaches and very clean seawater, with dolphins, turtles and many fish types. Despite of its natural attractions, the tourism has not been stimulated, not only due to the poor available infrastructure, but also to preserve the local ecology. During the last two years we have seen gigantic strides made tronic-radio equipment and the end is not yet in sight. Now we are hearing a great deal about micro-miniaturization. Where will it all end? No one yet knows; but we are inclined to think that from radio amateur's viewpoint that the appearance of an all-band transceiver (having a power output 100 to 200 watts PEP) housed in a cabinet the size of a cigar box is more than a few years off! There will always be a practical size for ham equipment beyond which nothing would be gained by making it any smaller. If you have never taken 6 meters equipment as your only station on a DXpedition you have missed one of the most exciting and interesting pleasures in all of ham radio. Nowadays you can take 1 transceiver with HF plus 50 Mcs (6 meters) like the brand NEW Kenwood TS480. This versatile transceiver is very pratical beacuse you can perform 2 different Menus you can programme the own transceiver example for Phone and CW, for Contest or DX'pedition and normal use. When I was in Rolas Island , with Wire Dipoles I've confirmation the very good receiver circuit. With an antenna tuner, you can prepare your antennas that you have calibrated previously without problems. I've used mostly SSB and CW and I've tested the DSP and equalizer circuits . The reason of course that there is so much solid state techniques is the needed for such equipment a rocket must lift and carry is very important - but when is so important that a ham transceiver be reduced in weight from 4 to 8 kgs? This is our NEW Transceiver Kenwood TS480 SAT support services we provide to all radio operators We've provided a number of resources here to help you on , report bugs, and suggest improvements to our products and service. You may also obtain technical support by e-mail or telephone at [KENWOOD]; and by e-mail . This is our NEW ANTENNA SYSTEM for our DX'peditions, very easy to assemble and on small bag it's easy for luggage at airport for flights. Well, we can spend lot of time discussing what is the better antenna and trying to found out what will be the good choice. In fact our experience all over this years told us you don't have to hurry with your transmission, but with reccepcion you must be envolve to get the better results. That's why we decide for a SPIDERBEAM (5 Bands) and a FORCE12 Vertical XK40.While the antenna is as light as a mini beam it maintains the gain and F/B ratio of a typical full size tribander. The whole antenna weight is only 6kg (12 lbs) making it ideally suited for portable use. It can be carried and installed easily by a single person. A small push-up mast and a TV rotator is totally sufficient, saving even more weight on the total setup. The transportation length is only 1.20m. This is our NEW EQUIPMENT,This "NEW TOY! is specially for RTTY and PSK31, excellent piece for Interfacing to a radio and computer, works very well with most of all Logging programs (N1MM, Writelog, CTK1EA, Logger, Looger32, etc. etc) you have PTT control and sound card control. In my last trip to West Africa, I've been very frustrated with my inoperation on FSK , PSK31 and SSTV, so we decide to found a good equipment. There are a few on Market, with a good performance. Permitting transmit all modes, of course including digital modes (RTTY,PSK31etc.etc) . With a electronic Keyer it's very good for the exactable CW operator. Welcome to the home page for Project. Take a look at 4W Project What's New in our web. Last updated: Outubro 30, 2009.WebMaster [ct1bww].